Art works, The Horn and Bubble Tech, by Marianne Greated were part of an exhibition, Artists who make Music/Musicians who make Art, curated by Ross Sinclair. The Horn is a visual representation of sound in the landscape. 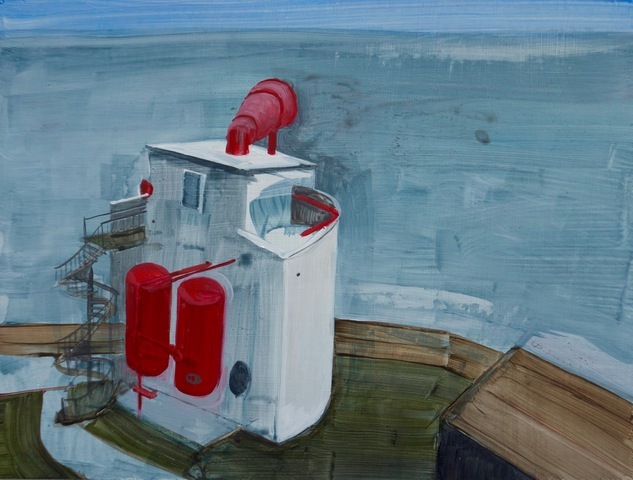 The painting depicts a fog horn from Sumburgh Lighthouse, one of the last working foghorns in Scotland and powered by Kelvin engines. Marianne Greated undertook an artist residency at Sumburgh Lighthouse in 2016. Bubble Tech is an edit of underwater sounds, the adhoc release of bubbles by underwater movements, recorded using a hydrophone. The works explore the cross over between visual and sonic experiences. The exhibition Artists who do Music/Musicians who do Art was at Queens Park Railway Club, Glasgow 24th February to 25th March 2018. It explored the relationship between art and music practice and methodologies. It featured 100 plus artists and musicians including 5 Turner Prize Winners and a host of artistic pop stars. This exhibition generated a host of press interest including BBC Scotland Radio, Daily Record, STV and various art reviews.